It'd be fair to say that Young Circles have started off from a solid base. As well as displaying sound instrumental prowess and an admirable will to push the boundaries, this debut album also shows clear signs of impeccable taste, a factor that aids them as much as any other. The Radiohead influence is obvious, but there are also remnants of other highly regarded bands such as Animal Collective and Yeasayer which provide their sound with a strong foothold. But while there's nothing here that's guaranteed to pull in hipsters like "My Girls" or to move feet like "O.N.E.," you feel that Young Circles could well be onto something that overall is more worthwhile than what either of those peers muster. Although there's still the guitar-bass-drum dimension to their sound, the primary focus of the band seems to be on electronics. That's not to say that Jungle Habits is a record without soul, but there's a definite coldness emitted through features such as the heavily processed vocals and the abstract synths which serves it well. Despite this heavy emphasis on technology, though, there's still a human touch about proceedings which reveals itself especially during the record's strongest moments. It's a fine balance which they perform well throughout, providing the basic indie-pop template with a fresh face through their tendency to experiment. The sound isn't the only area of this album that proves adventurous, though, as the actual songs themselves can also display ambition. The most obvious example of this is "Summer Noose," a mysterious beast which begins life as a run of the mill acoustic strum before morphing into a full-blown haunting odyssey which lasts nearly nine minutes. It's run time may seem a little exuberant, but it's easily the most interesting - not to mention best - song here, and provides concrete evidence that they're already a band to be reckoned with. It also displays their progress in such a short period of time, and it's hard to imagine that it's writers were playing fairly standard garage rock no more than two years ago. It's not all prog indulgence, though, since this is a record which also shows a welcome amount of variety. Indeed there are moments which seem surprisingly direct, chief among them being the single "2012." Although it's a song which initially stands out due to it's clattering opening, it also happens to be the catchiest tune on offer, and the regular tempo changes maintain that unpredictable edge which characterises most of this album. In fact, it's this unpredictability which could ultimately be the most exciting thing about Young Circles. They may not be the full package, but you feel that the style they have adopted could well be moulded into truly wonderful things. In fairness, there are times on Jungle Habits when Young Circles themselves do just that, so there seems no reason why they can't go on to perfect this template in the future. 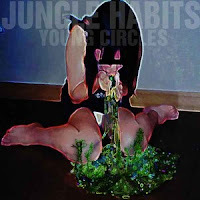 Jungle Habits is released on August 23rd. You can download the song "2012" for free here.